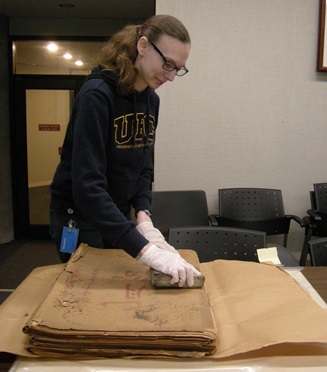 Since September 2016, Anne Lama, Conservator of UBC Library, has been leading a project to rehouse and preserve two Asian-language newspapers, Chinese Times 大漢公報 (1914-1992) and Rodong Sinmun 로동신문 (1967-1975). 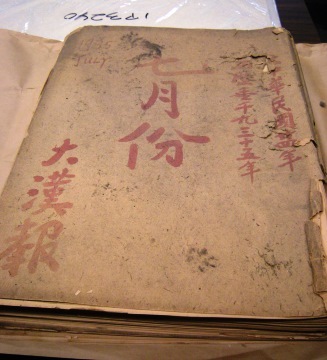 The preservation project began with the 220-volume of Chinese Times, which were originally stored in boxes, or bound in fascicles or wrapped in kraft paper as bundles. Some older issues are very fragile and pages are highly brittle. 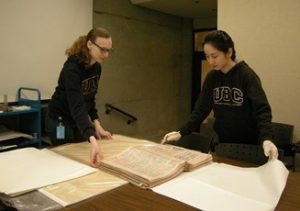 In the past eight months, UBC iSchool students Yanzhu Duan and Sarah Giesbrecht worked in the Asian Library once a week to preserve the newspapers by removing the dust, wrapping the papers with permanent buffer papers, and replacing the old boxes with newer and larger cases. At the same time they compiled an inventory list and barcoded the boxes. Item records are created after the newspapers arrived in the Rare Books and Special Collections. Chinese Times was first published in 1907 as Chinese English Daily News 華英日報. It was renamed as Chinese Daily News 大漢日報 in 1910 and Chinese Times 大漢公報 in 1915 under the management of Chinese Freemasons. Published daily (except Sunday and holidays) until October 1992, Chinese Times is the longest-running Chinese-language newspaper in Canada which provides valuable resources for researchers in Chinese Canadian studies. Asian Library received these original copies as donation from the publisher in November 1971. In addition to the printed copies, Asian Library also holds the Chinese Times in microfilm format. In 2007, Simon Fraser University digitized the newspapers under the Multicultural Canada digitization project. The online version is now searchable and can be accessed at http://chinesetimes.lib.sfu.ca/.